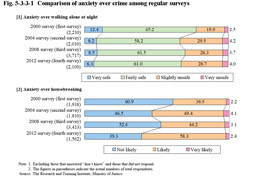 To the question “How safe do you feel walking alone in your area after dark?” the percentage of those that answered “very safe” declined by 2.2 points and the percentage of those that answered “slightly unsafe” rose by 2.4 points, compared to the 2008 survey (Fig. 5-3-3-1 ). 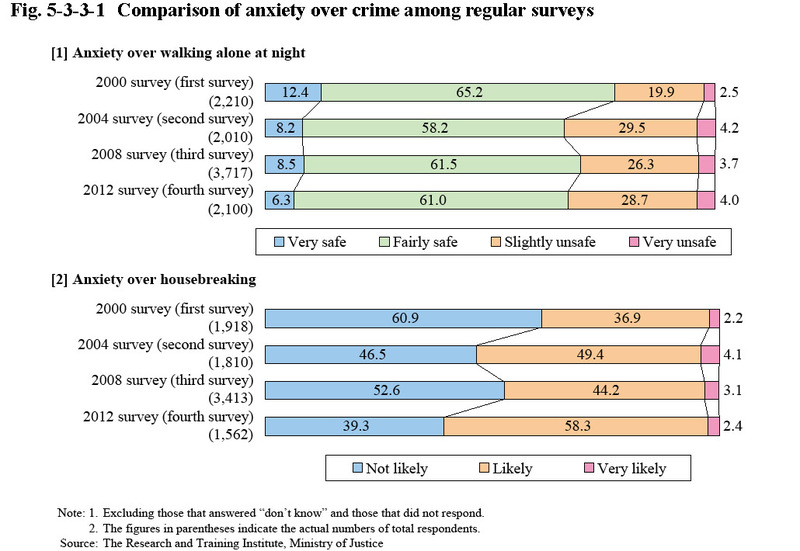 To the question “What would you say are the chances that over the next 12 months someone will try to break into your home?” the percentage of those that answered “not likely” declined by 13.3 points and the percentage of those that answered “very likely” or “likely” rose by 14.0 points, compared to the 2008 survey (Fig. 5-3-3-1 ).